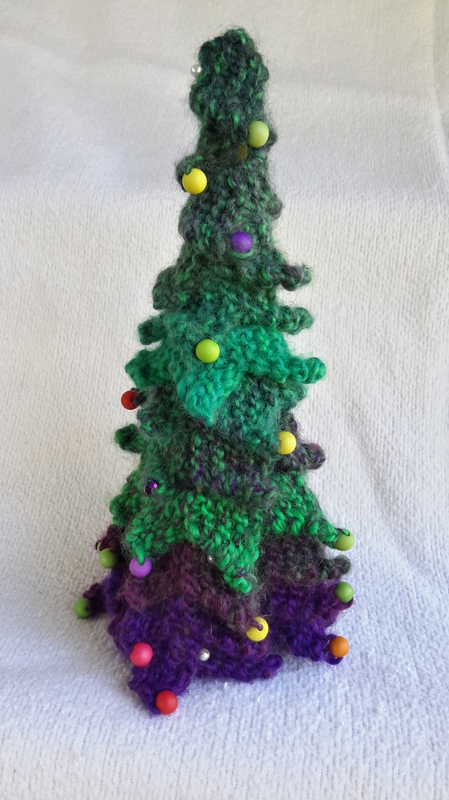 My knitted Christmas tree – Craft-a-licious . .
Dearest Readers – tah daaahh!! Oh yes, my first (and perhaps only) piece of knitted Christmas finery – a table ornament! Woo hoo!! Thanks to Bottheka’s lovely pattern, my miniature tree (about 21cm high and 11cm wide) is looking quietly spectacular on the little bench next to where I knit. Occasionally I’ll glance over and smile at it. Don’t you love it when what you’re making turns out even better than you hoped it would?! – and it makes it easier to live with all the other failureslearning experiences. Woo hoo again!! 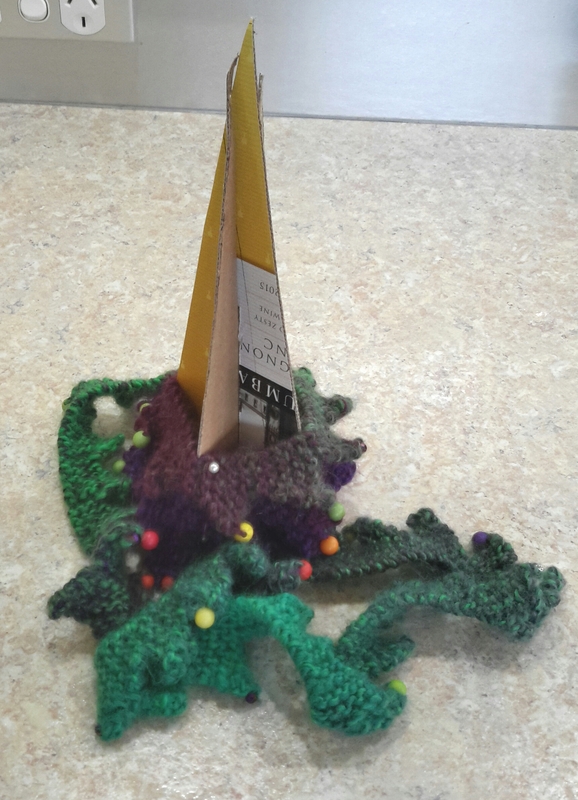 The structure on which this knitted wonder stands is made of card. I tried the core fluted card from a slab of Carlton draught which, unfortunately, was too thick, so had to abandon that trial. Husband was rather happy with this failed attempt, having to drink the 24 bottles of beer contained in said slab. Then came the pizza box card, again a fail for the tree, but a win for husband and wife. Lastly, the 4 litre wine cask card – which worked brilliantly. Yet again husband very happy to accommodate drinking of chardonnay so I could use the box, thus giving himself status of calling this ‘our’ project; but not before trying to drunkenly tell me the trials and tribulations he was going through just to keep his wife happy.. And me calling him an opportunistic alcoholic. If I was really smart I’d try and put a few led lights amongst the foliage. Hmmm, that would take me at least 2 months to figure out – and Christmas would be over by then. Perhaps I should tackle that next year. Or the year after. Hoping your Christmas festivities are in the starting blocks and rearing to go! Jen! Yr Garfield lit Chrissie tree last yr gave me inspiration! Hope all went well at the QA get together🎉🎄! Thank you!! Yes! – hopefully yr frangipini is in it’s full, scented bloom which would also make it the best parking spot in WA to be in! !